Weeding your book collection shouldn't be a big project that you devote yourself to, and then, after a few days (or weeks, depending on how long it's been put off) be able to pat yourself on the back, and walk away satisfied, knowing you won't have to tackle that yucky chore for another several months (or years, depending on how much of a hoarder you are). It's something that you should be doing bit by bit, every week, so that it doesn't pile up and get out of control. Here's a look at what I weeded earlier this week. Wow, that cover has seen better days, hasn't it? Pretty dogeared, and as you can see, the title has been ripped off. It's an adventure, we know that much! Let's take a look at the back cover. Oh my. This book has literally been loved to death. 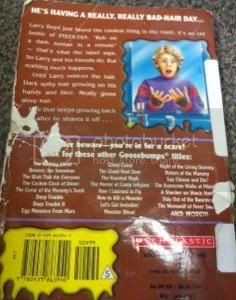 There are holes in the back of this paperback. The pages look pretty yellow, too. What prompted this weed? 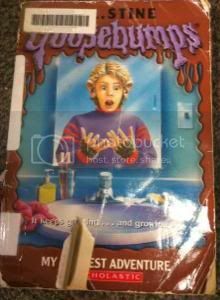 A nearly-new donation of a few Goosebumps titles to take the place of this busted-up bad boy. Although, in truth, this is something that could have been deselected a while ago, just based on condition. Shabby looking shelves are never good for business.